You are at:Home»iPhone»Power»My iPhone Power Button Is Stuck! What Should I Do? My iPhone Power Button Is Stuck! What Should I Do? Your iPhone power button is stuck and you don’t know what to do. The power button (also know as the Sleep/Wake button) is one of the most important buttons on your iPhone, so when something goes wrong, it can be a significant burden. In this article, I’ll explain what to do when your iPhone power button is not working and recommend some repair options so you can fix your iPhone and have it working like new. Former Apple technician David Payette informed me of a peculiar trend among iPhones with broken power buttons: Usually, they were inside a case with soft rubber over the power button. Some cases are made of soft rubber that tends to break down over time and, except in cases of extreme wear or damage, a soft rubber case was almost always used on iPhones with broken power buttons. Then again, he admits, a lot of people use rubber cases on their iPhones — but the trend was too common to overlook. If your iPhone power button is not working, you may want to consider not using your soft rubber case in the future. When the iPhone power button is stuck, the most significant problem people have is that they cannot lock or turn off their iPhone. Fortunately, you can set up a virtual button using AssistiveTouch, which allows you to lock and turn off your iPhone without having to use the physical power button. 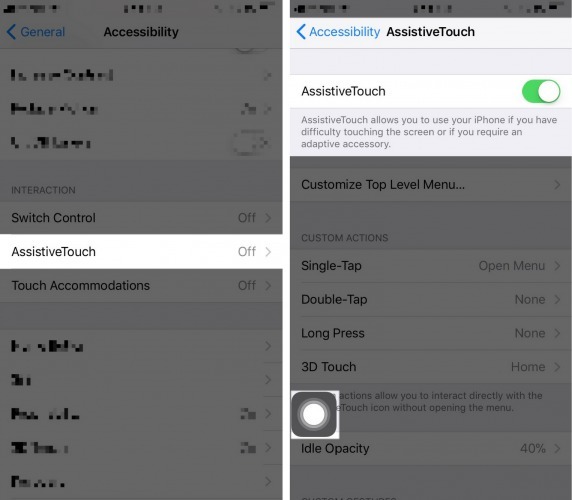 To turn on AssistiveTouch, begin by opening the Settings app. Tap General -> Accessibility -> AssistiveTouch, then tap the switch next to AssistiveTouch. The switch will turn green to indicate that AssistiveTouch is on and a virtual button will appear on the display of your iPhone. You can move the virtual button anywhere you’d like on your iPhone’s display by dragging it on the screen using your finger. Begin by tapping the virtual AssistiveTouch button, then tap the Device icon, which looks like an iPhone. To lock your iPhone, tap the Lock Screen icon, which looks like a lock. If you want to turn off your iPhone using AssistiveTouch, press and hold the Lock Screen icon until “Slide to power off” and the red power icon appear on the display of your iPhone. Slide the power icon from left to right to turn off your iPhone. How Will I Turn My iPhone Back On If The Power Button Isn’t Working? If the power button is stuck, you can turn your iPhone back on by plugging it into any power source such as a computer or wall charger. After connecting your iPhone to a power source using your Lightning cable (the charging cable), the Apple logo should appear on the screen of your iPhone before turning on. Don’t be surprised if it takes a few minutes before your iPhone turns on! If your iPhone doesn’t turn on when you plug it into a power source, there’s possibly a more significant hardware issue than just a jammed power button. Below, we’ll discuss your repair options if you want to get your power button fixed. Can I Fix My iPhone Power Button By Myself? The sad truth is, probably not. David Payette says that as an Apple tech with experience working with hundreds of iPhones, when a power button gets stuck, it’s often stuck for good. You can try using compressed air or an antistatic brush to remove debris, but it’s usually a lost cause. When the tiny spring inside the power button breaks, there’s not much you can do to fix it. If your iPhone is still under warranty, the Apple Store may cover the cost of the repair. You can visit Apple’s website to check your iPhone’s warranty status by going to. If you decide to go to your local Apple Store, we recommend that you schedule an appointment first, just to make sure that someone will be able to help you out as soon as you arrive. Apple also has a mail-in repair service that will fix your iPhone and return it to your doorstep. If you’d like to repair your iPhone today, then Puls may be the best option for you. Puls is a third-party repair service that sends a certified technician to your home or place of work to fix your iPhone. Puls repairs can be completed within an hour and are protected by a lifetime warranty. A broken iPhone power button is always an inconvenience, but now you know what to do when it happens. We hope you’ll share this article on social media, or leave us a comment down below if you have any other questions about your iPhone. Thanks for reading this article, and remember to always Payette Forward. Previous ArticleMy iPhone Says iMessage Is “Waiting For Activation”. Here’s The Fix! Next Article Where Can I Replace My iPhone Screen? Get It Fixed Today!